Tintern01291 689251work TownFew fail to be moved by their first glimpse of Tintern Abbey. Set in the Wye Valley Area of Outstanding Natural Beauty, the atmospheric ruins of this Cistercian monastery were recently included in Country Life's top ten British heritage sites. Few fail to be moved by their first glimpse of Tintern Abbey. Set in the Wye Valley Area of Outstanding Natural Beauty, the atmospheric ruins of this Cistercian monastery were recently included in Country Life's top ten British heritage sites. 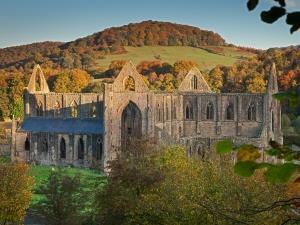 Already a must-see destination by the 18th century (as part of the Wye Tour along the river), the abbey has inspired poems by William Wordsworth and Alfred Lord Tennyson and paintings by JMW Turner. Tintern has touched the World in many ways. It was the centre of industry for hundreds of years - conservation work has revealed that there were countless forges and furnaces along the Wye and its tributaries in the 16th, 17th and 18th centuries. Brass was first made in Britain at the Abbey Forge and it was the first place to make wire on an industrial scale, most notably the first transatlantic cable was made here.